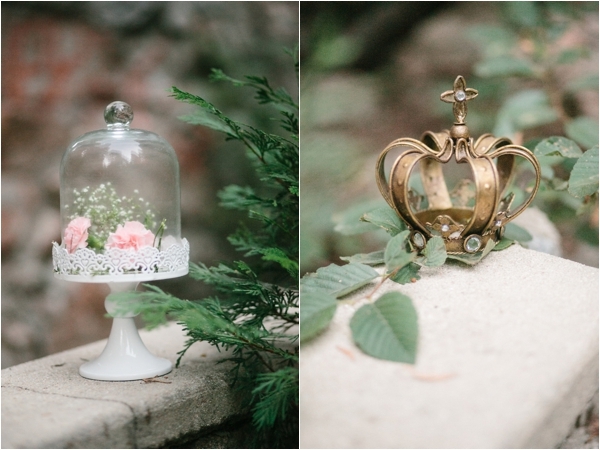 This magical and unique engagement session, inspired by Harry Potter and Snow White, was photographed by the talented Kristen Booth. 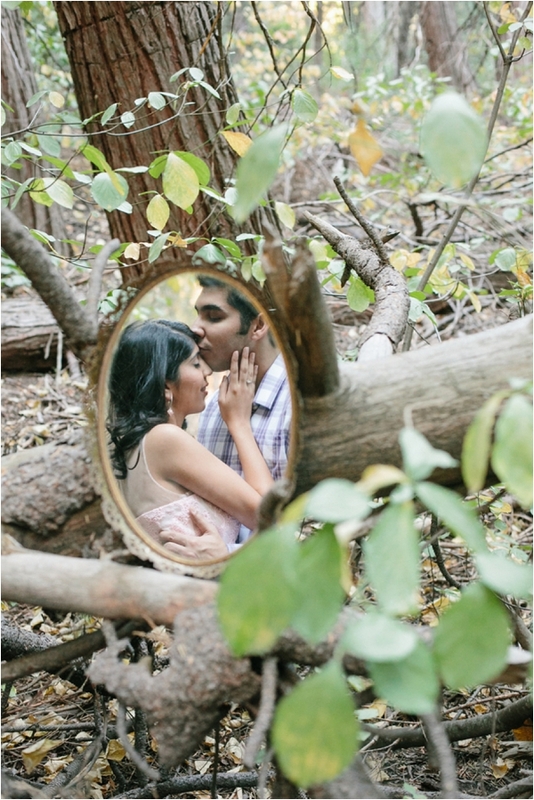 Y'all know how much I love me an engagement session that represents the couple as individuals and a couple. 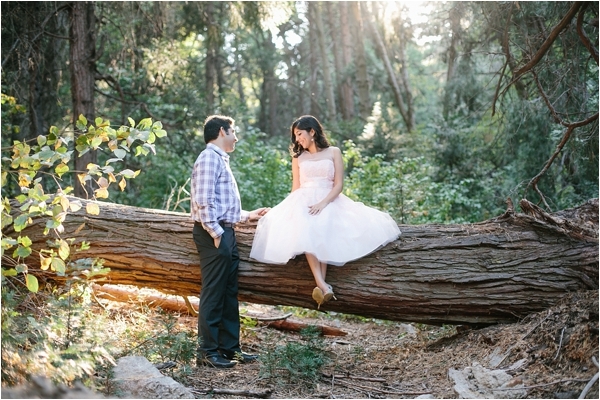 Their love story and proposal are just too sweet to miss, so scroll through the images and you'll find their story after all the images. Thank you Kristen for sharing this shoot with me! 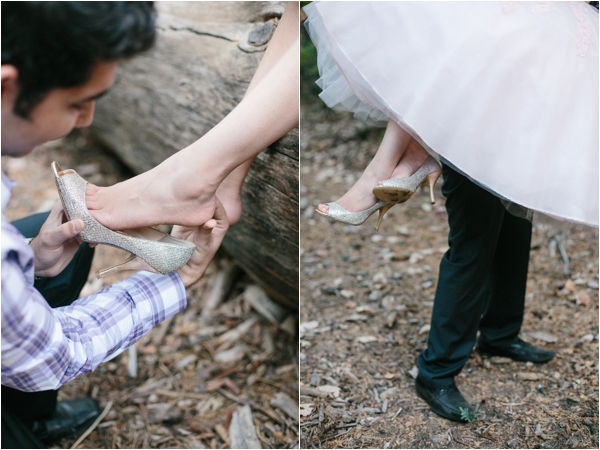 From the couple: I had been dreaming of a different type of engagement session. 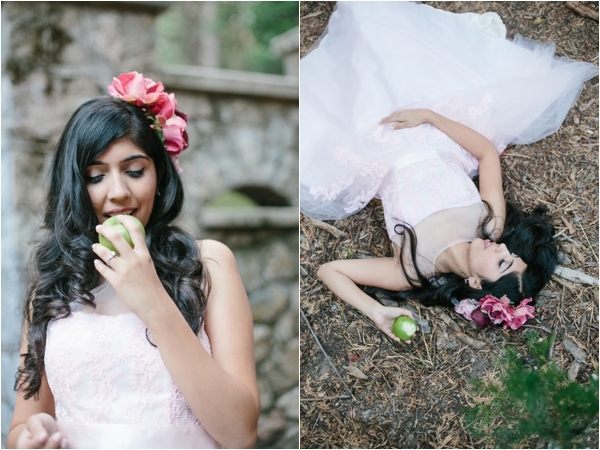 I am very into fairytales, so I had my heart set on finding someone to photograph me and Anubhav like fairytale characters. When I found Kristen, it was like the stars had aligned in our favor! 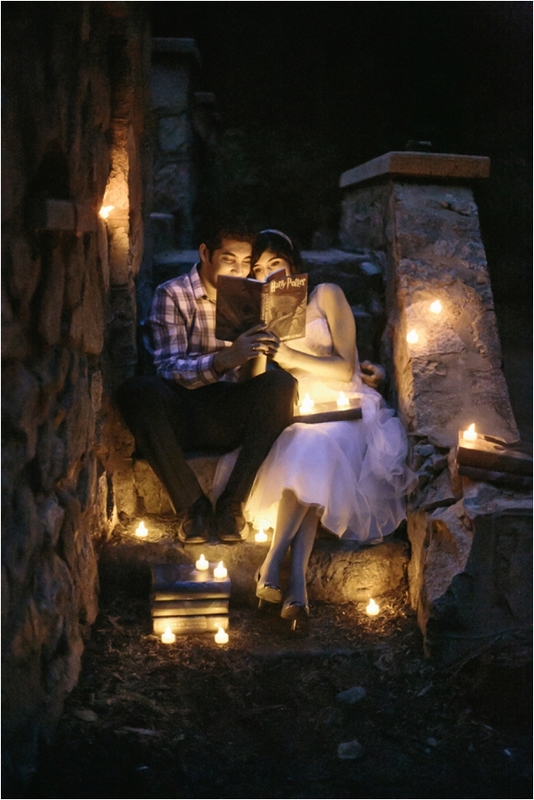 Her whole business is to turn love stories into real life fairytales. When I told Kristen my ideas, we both became ecstatic about working with one another. 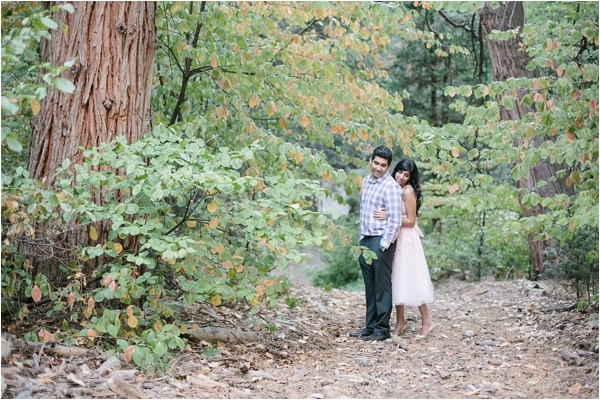 Anubhav and I had an amazing time running through the forests of the San Bernardino Mountains in our fancy dresses and sparkly shoes. It was a once in a lifetime kind of opportunity to make believe and pose for couture magazine-like photos! It was like a fairytale come true for anyone watching. And Kristen brought all of our imaginings to life! Their love story: Our website (www.anusquared.com) has the story in very vivid details, but so as not to bore you, here is the short version: Anubhav and I went to UCLA at the same time. Although we were never real-life friends at that time, we had become Facebook friends (as everyone does in college). Three years after graduating college, I was browsing on my Facebook and came across a status message written in Hindi. Since I speak Hindi at home, I was very excited to understand his message. Soon after, he had another status about how much he loved his younger sister. Those two statuses lured me into finding out more about Anubhav. I initiated all the conversations and got him to notice me. We happened to be living in the same city. He was working and I was in law school. After many failed meetings, we finally met for lunch, which led to a movie, which led to a whole night of talking, which led to breakfast, which led to 2 years later when he proposed. It sounds like it was love at first sight, but I was actually not impressed by him at our lunch meeting. But when you find someone who makes you laugh every day, often times uncontrollably for hours on end, you can't help but fall in love. Although we could have met at UCLA, things work out as they should, and we couldn't be happier. 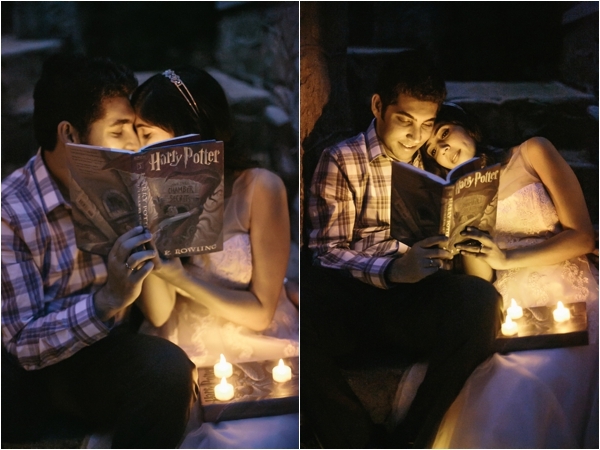 The proposal: Anubhav, my brother and I were planning a trip to The Wizarding World of Harry Potter in Orlando, FL from February 18-20, 2012. I have been a “Potterhead” since high school, so it was very thoughtful of Anubhav to use this knowledge in devising his plan. But it was also clever because I was so blinded by my excitement for the theme park, I set aside all the strange things Anubhav and my brother were doing throughout the day. We arrive at the Wizarding World on Saturday morning. The day feels normal to me. I don my home-made “Weasley is our king” t-shirt, lion hat, and blue and bronze scarf – I am dressed as Luna Lovegood, of course. The three of us spend the morning exploring Hogsmeade, drinking pumpkin juice, visiting Ollivander's wand shop, and taking a ride on a Hippogriff. Strange Thing #1: We leave Hogsmeade after only 1.5 hours so that the guys can charge their phones at the Universal CityWalk Starbucks. I am a bit puzzled as to why we would waste precious Potter time charging phones, but I just go with the flow. We had bought 2-day tickets, so I figured my brother just wanted to spread out the fun throughout the weekend. (**The guys needed their phones to stay in contact with the videographer and photographer – Yes, that happened.) Strange Thing #2: We spend a good chunk of time roaming around Universal CityWalk. Anubhav announces that he is going to the restroom. He then says to my brother, “You should come with me.” Hmmm...odd. I start to get suspicious, but I cannot connect the dots. 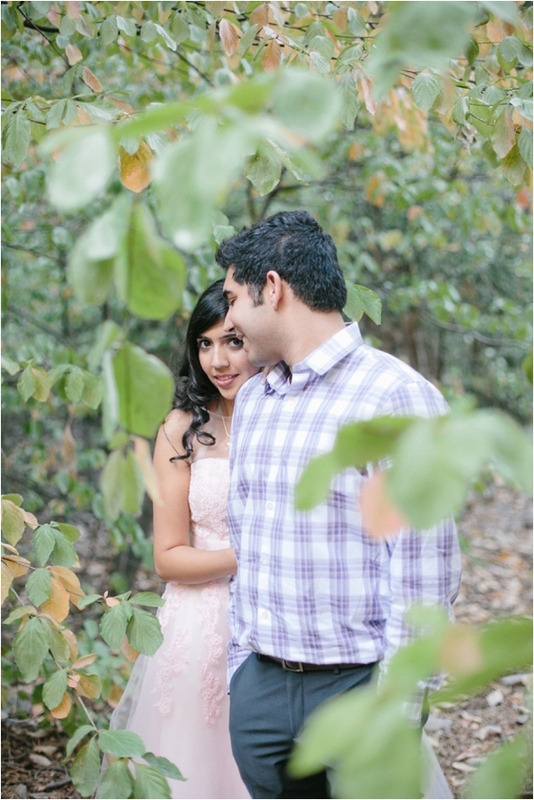 The thought does cross my mind that Anubhav is about to propose in random NBA City -- thankfully he does not! (**My brother was carrying the ring in his pocket and Anubhav wanted to to switch carriers.) Strange Thing #3: We finally make it back to Hogsmeade, only to have my brother drop me and Anubhav in the line for butter beer. He leaves on the pretenses of changing our Mythos reservations for the next day, to a later time. I tell him we really don't need to go to Mythos and he should hang out with us. He tells us to buy him a butter beer and he will be right back. Why would my brother, of all people, miss the chance to purchase a butter beer with his wizarding money? (**My brother had to collect the photographer and videographer.) Strange Thing #4: Anubhav has his hands in his pockets the entire time after NBA City. Anytime I walk on his left side, he asks me to walk on his right. Weird. In line for butter beer, he all of a sudden claims he is feeling feverish and ill (probably the nerves!). Knowing how often Anubhav gets a cold, I believe him. (**Anubhav had the ring in his left pocket and probably needed to touch it the entire time for fear of losing it.) Strange Thing #5: Anubhav tells me my brother changed the Mythos reservations. Two minutes later my brother arrives and says, “Anuja, I couldn't change the reservations. Come help me change it.” I reply, “Guys, we REALLY don't need to go to Mythos. It's not a big deal. We can eat somewhere else.” My brother says, “No, no, we want to go to Mythos. Please come help us change it.” So I head towards Mythos with my untouched butter beer. I see there is a photographer and videographer set up on the bridge filming a Hogwarts student. I hurry past them so as not to disturb their footage. My brother stops us in the middle of the bridge. “This is great shot in front of Hogwarts castle – Anuja, give me your camera.” I thought we needed to change the reservations, so I say we can take the picture afterwards. Clearly I am clueless. So Anubhav gives my brother my camera and proceeds to put his hand around my waist. He nervously whispers, “Anuja...” And then I know. The next moments are a blur. I see flashing lights, a bright glow from the videographer. 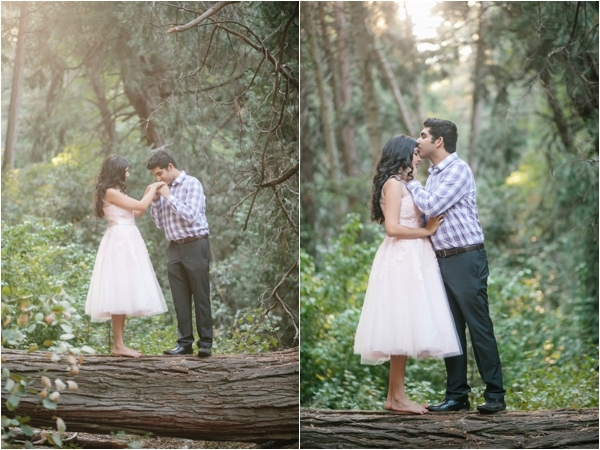 Anubhav is down on his knee and saying some things about “I love you” “Will you marry me?” I see a box. I see a ring. There is a lot of nervous laughter on my end. A lot of “This is weird” “This is awkward.” A small crowd has gathered. There is some cheering and clapping. Some hugging and kissing. I am completely taken by surprise. My eyebrows are furrowed quizzically and I cannot stop laughing and smiling. Later I find out that everyone knew but me. In fact, half my friends and family were in on the planning. I had my suspicions, but Anubhav thwarted every suspicion by casting doubt left and right. He knew how difficult it would be to surprise me. But he succeeded! I was just so happy that my family knew. And what was even more special was that my brother was a representative of my family, experiencing the moment with me. It was truly a MAGICAL trip!